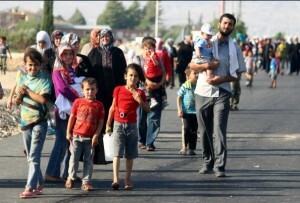 The number of Syrian refugees in Lebanon will surpass 400,000, the UN refugee agency said earlier this week. Up to 251,407 Syrian refugees have been registered, while 145, 524 are waiting for finalizing their registration process, the UN said. Some 110,204 refugees were registered in northern Lebanon, 95, 457 in the Bekaa area, 25,746 in Beirut and Mount Lebanon, and 20, 000 in southern Lebanon, said the report. The UN refugee agency said some 48,000 Syrians who were forced to leave their war-torn country took shelter in Lebanon in March. The UN had estimated that by June 2013 the number of Syrian refugees would reach one million, but that figure has already been reached in Turkey, Jordan, Iraq and Egypt. There are fears that as the death toll rises, the number of refugees could reach 1.5 million by the end of the year. Earlier this year, the UN appealed for $1.5 billion to salvage the “dramatically deteriorating” humanitarian situation. Russia has in previous months pledged to help Lebanon deal with the tide of refugees. Speaking to his Lebanese counterpart Michel Suleiman in Moscow in January, Putin said Russia would help Beirut deal with the large numbers of refugees pouring over its border with Syria. “If the countries concerned agree with this, we shall be prepared to suggest Moscow as the venue,” Putin said.